Why Should You Buy from Conicelli Hyundai? The Conicelli family knows a thing or two about cars. We have been supplying drivers from all across Pennsylvania with top-quality automobiles since 1957, and the members of our auto sales, service and financing teams know what it takes to make customers happy. We work hard to earn our reputation as "A Nice Place to Do Business." Conicelli Hyundai is Pennsylvania's No. 1 volume Hyundai dealership 2013, 2014, 2015, 2016, 2017 and 2018*. We have an enormous inventory of new and used Hyundai models, including Hyundai's award-winning Elantra, Sonata and Kona. We have a hard-working sales team ready to pair you with the compact car, mid-size sedan, crossover or hybrid of your dreams and a highly-trained service team prepared to keep those dreams alive. And the customer service and car-shopping environment are truly second to none. Why Else is Conicelli Hyundai a Nice Place to Do Business? Since 2005 we've ranked among the Top 10 dealerships in the USA for Internet Sales, according to Ward's e-Dealer's magazine. Have we mentioned that we are the No. 1 Volume Hyundai dealer in Pennsylvania for 2013, 2014, 2015, 2016, 2017 and 2018? * We have over 450 new Hyundai models for sale, plus over 100 pre-owned or Certified Pre-Owned vehicles in our used vehicle inventory. You can't beat that trademark Conicelli convenience. 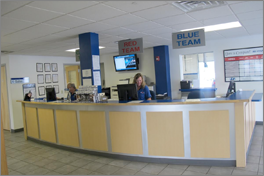 We accommodate your needs throughout our dealership, from our state-of-the-art service facility to our extended service and parts hours, 7:30 a.m. to 7:30 p.m. every weekday. We even work on Saturdays! It's fast and easy to schedule Hyundai service appointments at our dealership, and we perform all the standard services you'd expect, including tire rotations, parts installation and brake inspection and replacement. We offer all the amenities you've come to expect, including free Wi-Fi, a comfortable waiting area, free shuttle service (within 10 miles) and more. When you buy a new Hyundai at Conicelli Hyundai, your first maintenance is free! And speaking of "free," in thanks for your patronage, we also provide a 60-day or 3,000-mile limited warranty on any used car sold at Conicelli dealerships and a free annual safety inspection for any vehicle you buy from us. And you won't have to stop for gas with our free tank of gas on delivery. The car-shopping experience you deserve is waiting for you at 1208 Ridge Pike in Conshohocken, easily reached via all major Pennsylvania routes, including the Blue Route, the Schuylkill Expressway and PA Turnpike. Stop by today! *Based on Hyundai new vehicle volume sales for 2013, 2014, 2015, 2016, 2017 and 2018 as reported by Hyundai.